It’s spring in New York City, which means that a new theatre season has arrived! This is one of my very favorite things about living on the east coast, going into the city to see new shows. This past week, we were invited to come see the new musical If/Then starring the singing sensation Idina Menzel. I think everyone on the planet knows who Idina Menzel is now after seeing/hearing Frozen. So this was a treat to get to see her perform live. Be warned, though, this musical is not for little ears, whatsoever! The themes in this show are very adult oriented and there is some strong language, so it is best enjoyed by older audiences. Have you ever thought about how your life would be different if you made one small decision differently? This is the premise of the musical If/Then. After getting married and spending the last ten years in Phoenix, Elizabeth makes the decision to end her marriage and come back home to live in New York City. When she arrives, she finds she can become Beth, the high-powered business woman, or Liz, the woman who follows her heart. Each small decision she makes impacts who she will become and, on stage, we see what would happen if she chooses another path. Seeing both lives unfold in the musical is really thought-provoking. So much can be said about this show. It is reminiscent of Rent, geared towards a new generation, but I enjoyed it even more. The set is something that I loved, very simple, yet it transforms so seamlessly into a city landscape, subways, offices, and apartment buildings. I love that the city is built into the story so well. Great songs, incredible voices–really, to hear Idina Menzel sing live is unlike anything you have ever heard before, and wonderful acting by all the cast. But the messages really hit home to those about to arrive to their forties; what if I made a choice that sent me on an entirely different path? Would things turn out ok? The show is witty and humorous, touching and sad, all at once. The characters are developed and portrayed so well, you find yourself connecting and attaching to them at once. As a member of the audience, you are fully invested in the outcome of Liz/Beth’s lives and are anxious to see the impact of her choices. This show is definitely going places and I fully expect to see some Tony nominations in it’s future. It is a fantastic show that is not to be missed! You can see the show for yourself by visiting their website and ordering tickets. 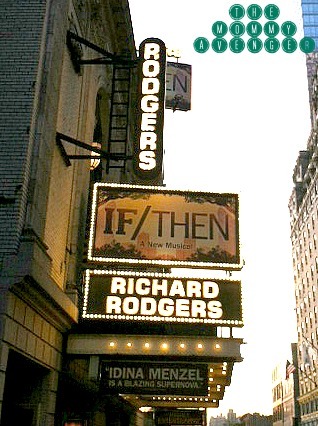 If/Then is currently playing at the Richard Rodgers Theatre in New York City. * I was invited to see the show, all opinions are my own.